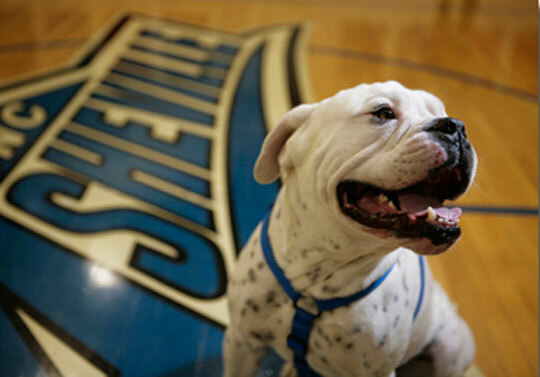 ASHEVILLE, NC – The new bulldog mascot for the University of North Carolina Asheville began his college career as a rescued dog at the Escambia County (Alabama) Animal Shelter. His name was Rebel when he was rescued along with a female named Dixie in early 2008. Dixie and Rebel were the proud parents of 10 beautiful puppies. Their owners surrendered them to the animal shelter, according to Renee Jones, director of the Humane Society of Escambia County, Ala.
Jones fostered the canine family at her home for nine days before they were moved to the Rockin’ P Boxer rescue in Jackson, Ala.
“I sent her the pics of how adorable the pups were and she agreed to take them. Two of her wonderful volunteers met us in Montgomery and crammed the two adults along with the ten puppies into a small little neon and off they went,” Jone said. Rebel was later transfered to a rescue shelter in Georgia. For years, UNC Asheville’s bulldog mascot, Rocky, has been known to be tenacious, strong and courageous… now rescued can be added to this list of traits. The University unveiled its new live mascot “Rocky I,” a white Victorian Bulldog with black spots, at half-time of the men’s basketball homecoming game against Coastal Carolina on February 21, at UNC Asheville’s Justice Center. Rocky I will make his triumphant entrance following the presentation of the 2009 Athletics Hall of Fame inductees. The University has had four live bulldog mascots dating from 1948 to the early 1980s. The tradition lay dormant for more than 20 years until recently. About two years ago, students, alumni and staff began working diligently to bring back the tradition. Alumni couple and dog lovers Alexis and Ed Johnson volunteered to be the mascot’s keepers and trainers. Ed, who is a lecturer in UNC Asheville’s Mathematics Department, began contacting breeders across the southeast. For months he had little luck finding the right dog. On a whim one day, Ed started researching bulldog rescue organizations. In less than 30 minutes he found what seemed like a perfect match in Rebel. Last November, Ed and Alexis drove to Georgia to meet the rescued Victorian Bulldog and to determine if they could mold him into mascot material. Immediately they knew they had found Rocky I.
Frazier agrees and sees Rocky’s rescue from Georgia as especially serendipitous. LEXINGTON, Va.—Beau Zinman hit a two-run home run and Ryan Dull picked up his first victory of the season as UNC Asheville defeated VMI, 9-4, Sunday afternoon in the final game of a three game series. Dull earned his first collegiate victory throwing six innings, allowing three runs on six hits and striking out five Keydets. Grier Harrington pitched the final three innings allowing one run on four hits for his first career save. The victory snaps a nine-game losing streak for the Bulldogs who move to 4-17 overall and 2-6 in Big South play. VMI suffers its first conference loss falling to 10-11 overall and 4-1 in the conference. Both teams scored single runs in the second inning. Walks to Derrick Hopkins and Mike Vaughn got the Asheville half of the inning started. Jonny Eaker singled home Hopkins to give the Bulldogs their first lead of the series. VMI tied the game in the bottom of the inning. Sam Roberts doubled to lead off and scored on a RBI single by Jacob Morley. The Keydets took the lead in the fourth inning on a triple by Alex Haitsuka that scored Justin Topping from first base. The Bulldogs took the lead for good with four runs in the top of the fifth. Eaker reached on a throwing error to begin the rally. Danny Baatz singled through the left side to put runners at first and second with one out. Kevin Weidenbacher, who had two hits in the game, doubled home both runners to put Asheville up 3-2. After a ground out, Zinman connected on his third home run of the year to make the score 5-2. In the sixth, Austin Graham led off with a double and scored an unearned run on a VMI throwing error that allowed Eaker to reach base. Asheville plated three more unearned runs in the seventh. Weidenbacher reached on an error to start the inning and moved to second base. After a sacrifice bunt moved him to third base, Zinman laid down a squeeze bunt to score Weidenbacher. Reed Kreiser was hit by a pitch and Graham picked up his second hit of the game. Vaughn came through with a two-RBI double to move the score to 9-3. VMI scored the final run of the game on a bases loaded walk to Toppings that pushed across A.J. Yoder. Harrington then struck out Haitsuka to end the inning. Jeremy Brown took the loss for the Keydets dropping to 1-4. He went five innings, allowing five runs (two earned) on seven hits. Asheville returns to action on Tuesday as it travels to East Tennessee State for a 7 p.m. game. ASHEVILLE, N.C. – #12 Coastal Carolina got four hits and three RBIs from David Anderson as the Chanticleers held off UNC Asheville 9-4 in Big South Conference baseball action Sunday evening at McCormick Field. The teams were scheduled to play a double-header on Sunday but rain in the morning in the Asheville area forced the teams to play just one game. The series will try and conclude on Monday with a double-header scheduled to start at 2 p.m. The Bulldogs (3-12, 1-3-0 BSC) battled Coastal Carolina (15-1, 1-0 BSC) on the day as they rallied from a 5-0 deficit to cut the lead to 5-4 with three runs in the sixth inning but the Chanticleer bullpen kept Asheville at bay the rest of the way. The Bulldogs were led at the plate by left-fielder Beau Zinman who went 3-for-4 with one run scored and a double. Carolina starter Cody Wheeler (3-0) picked up the win with five innings pitched. He scattered five hits, allowed one run, struck out four with no walks. T.J. Swank finished the game for the Chants and earned his first save with two scoreless innings of work. The Chanticleers struck for two runs in the first on a ground-out from Chance Gilmore and run-scoring single from Anderson. The visitors pushed across two runs in the fourth as a sacrifice fly from Daniel Bowman and run-scoring double from Taylor Motter to increase the lead to 4-0. Anderson singled in Gilmore in the fifth to pad the margin to 5-0. The Bulldogs got on the board in the bottom of the fifth. Freshman Jordan Lurie’s infield single plated Danny Baatz to narrow the lead to 5-1. Asheville made the game close with three unearned runs in the sixth. Reed Kreiser led off with a double and then went to third on Zinman’s double to right field. CCU reliever Tom Winegardner got the next two outs and almost escaped from the jam but a throwing error by Motter at shortstop scored two runs to cut the lead to 5-3. A pinch-hit single from Derrick Hopkins got the Dogs even closer at 5-4. Gilmore got a run back in the seventh with a sacrifice fly to get the lead to 6-4. The Chanticleers sealed the victory in the ninth with three insurance runs. Anderson’s infield single padded the lead to 7-4. Adam Rice then delivered a two-run double to increase the lead to 9-4. GREENVILLE, N.C. – Jared Avchen’s two-out two-run double in the bottom of the eighth inning gave No. 20 East Carolina a 4-2 win over UNC Asheville Tuesday afternoon at Lewis Field inside Clark-LeClair Stadium. With the win ECU improves to 9-2, while UNC Asheville drops to 3-10. With the score tied at two in the eighth, the Pirates put together three consecutive hits which was capped off by Avchen’s double down the left field line that plated Drew Schieber and Dustin Harrington for a 4-2 advantage. Schieber laced a two-out single to left, which was followed by Harrington’s second hit of the game, a single to center setting up Avchen’s at-bat. Brad Mincey picked his third win in relief working two innings of shutout ball with two strikeouts. Starter Mike Anderson went six innings allowing two runs on five hits and fanned a career-high six batters. Seth Simmons closed the game by notching his second save of the season and fourth of his career setting the Bulldogs down in order and recording two strikeouts. Ryan Dull (0-3) suffered the loss for UNC Asheville allowing two runs on four hits with a walk and strikeout in two innings of relief. Michael Bogaert went three innings, gave up one run on three hits with a pair of punch outs in the start. Bridging the gap between Bogaert and Dull was Grier Harrington, who surrendered one run on three hits with two strikeouts. Beau Zinman gave the Bulldogs and early 1-0 lead in the second when he took a 2-0 offering from Anderson out to left field for his first home run of the season. The Bulldogs extended its to 2-0 when Kevin Weidenbacher drove in Cody Buch with an RBI single up the middle in the fourth frame. Buch reached base when he stroked a two-out double down the left field line. ECU finally got on the board in the bottom of the fourth on Brandon Henderson’s sac fly to center that pulled the Pirates within one, 2-1. Stephen Batts, who extended his hit streak to 13 games, led off the inning with a double to left-center then swiped his seventh base of the season when he took third. The Pirates knotted the game at two on Ryan Wood’s sac fly in the seventh. Harrington led off the frame with a single up the middle then moved to second on Avchen’s sac bunt. Devin Harris recorded his second base knock of the game pushing Harrington over to third, putting runners at the corner before Trent Whitehead loaded the bases on a free pass.